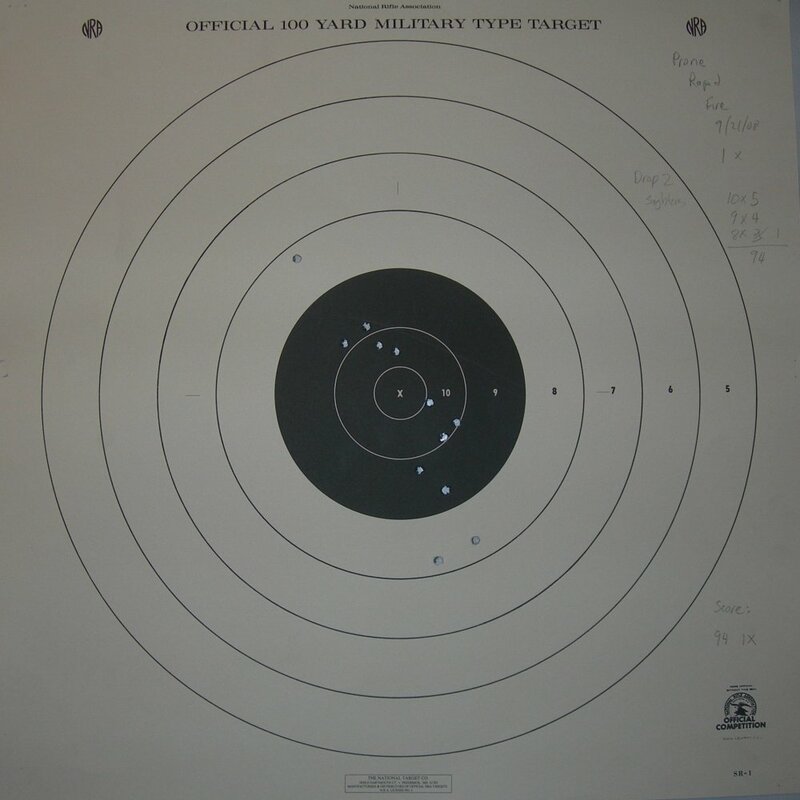 Well, I spent most of the day at the range today working through the Summer Rifle Match. 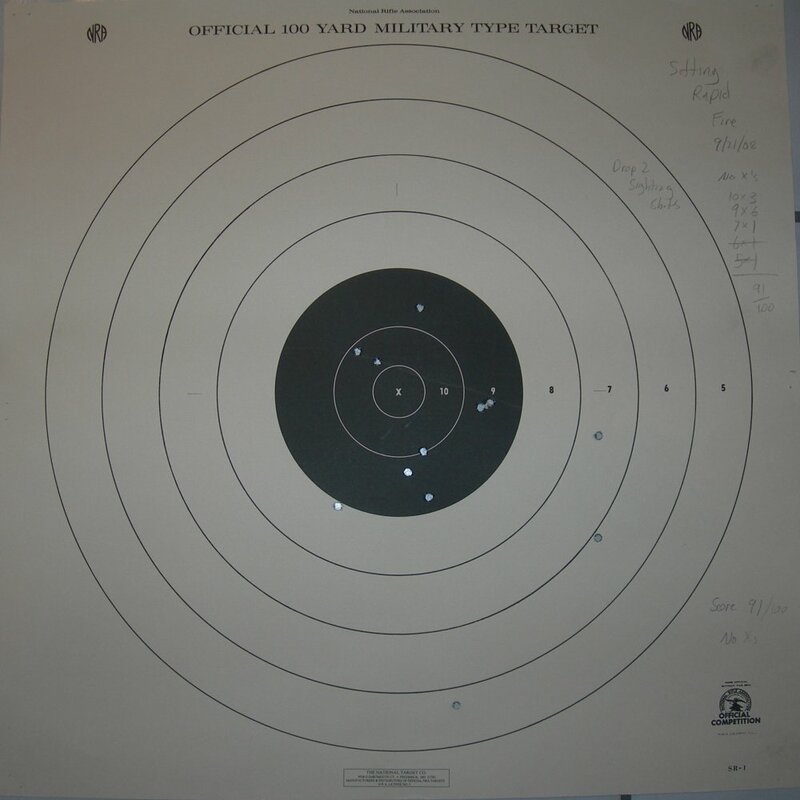 Just to give you some background on my high-power experience, next Sunday I will shoot my club’s Garand match. This will be the first formal high-power match I will ever have shot. So far the only shooting sports I even have a classification for are NRA and IHMSA Air Pistol Silhouette, IHMSA Smallbore and IHMSA Field Pistol. 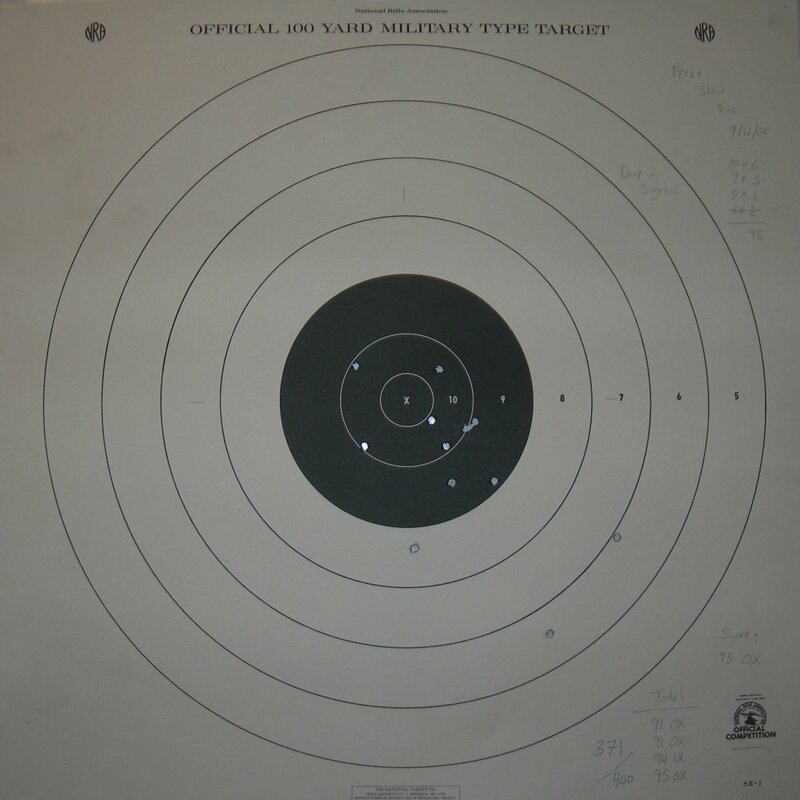 My high-power shooting has been entirely the occasional fun afternoon at the range. The rifle I used was an AR-15, an Armalite M15A4, with open sights. It’s a production gun with no modifications other than me adding the bird cage flash suppressor and bayonet lug after the AWB expired. Doesn’t add much to the rifle shooting wise, but it felt good leaving that piece of garbage law behind. Ammunition was hand loaded. 55 grain Hornady FMJBT w/ cannelure powered by 21 grains of IMR-4198 with a CCI 400 small rifle primers, all held together with unfired Lake City NATO spec brass. Total 371 out 400, but it seems I can’t find the X ring very often. Some observations which I may or may not be crazy about. For one, I could swear that hand loaded ammunition ejects brass is a more consistent pattern than factory ammunition. My brass was usually in a nice arrangement on the ground. I often have to hunt down factory ammo because it gets ejected wildly. Two, I could swear my point of impact was lowering with the use of the sling, but I find it hard to believe the sling could bend the barrel down enough to matter. Two, I could swear my point of impact was lowering with the use of the sling, but I find it hard to believe the sling could bend the barrel down enough to matter. It’s not bending it so much as it’s affecting the harmonics of the barrel. Watch a video of AR-15, or any rifle for that matter, captured under high speed cameras. The barrel whips around a bit while firing. By pulling down on it w/ the sling you’re discouraging it from traveling upward. just a bit, but it’s there. Not hard to imagine that a little extra tension near the muzzle would change POI. Nice offhand. Must be a silhouette shooter. :) I’m assuming you didn’t shoot it with a proper shooting coat–a 90+ with no sling is darn good shooting. And even with a shooting coat, a darn good score with a stock AR trigger. The sling will definitely change the point of impact on a non-free-floated barrel. I’m not sure if it’s bending or harmonics, or some other mechanism, but you’re not imagining it. I wouldn’t worry about the Xs much. When I was starting (especially in offhand) I’d jump on the trigger too much–it’d result in Xs, or 8s or worse. As I got better (and relaxed more), the 8s and worse turned into 9s or 10s, but the Xs also became 10s. Well one of the big reasons handloads group better on paper all interacts with the action of your gun. Hotter load will impart a bit more energy to the action and possibly cause stronger ejection, chamber fit will also change ejection. Yeah… offhand I’m used to. I’m not that practiced with a sling, or in the sitting or prone positions. My offhand shooting with an AR is pretty decent. I’m not nearly as good with the Garand, which should make next week’s match interesting. I need more upper body strength, because I struggle with heavy rifles offhand. Are you shooting with the silhouette position, with your elbow away from your ribcage? Or the round-target style with your elbow on your ribcage? If silhouette, getting your elbow on your ribcage might take care of that problem rather nicely. With the AR, I’m holding on the ribcage, with my Kimber 82 22 target rifle, my elbow is in, but it’s not tight. I can’t seem to find a stance for that gun where I can let bone bear all the weight. I’ve tried getting my hip out more, and get my elbow on that, but that tends to make me sway too much. 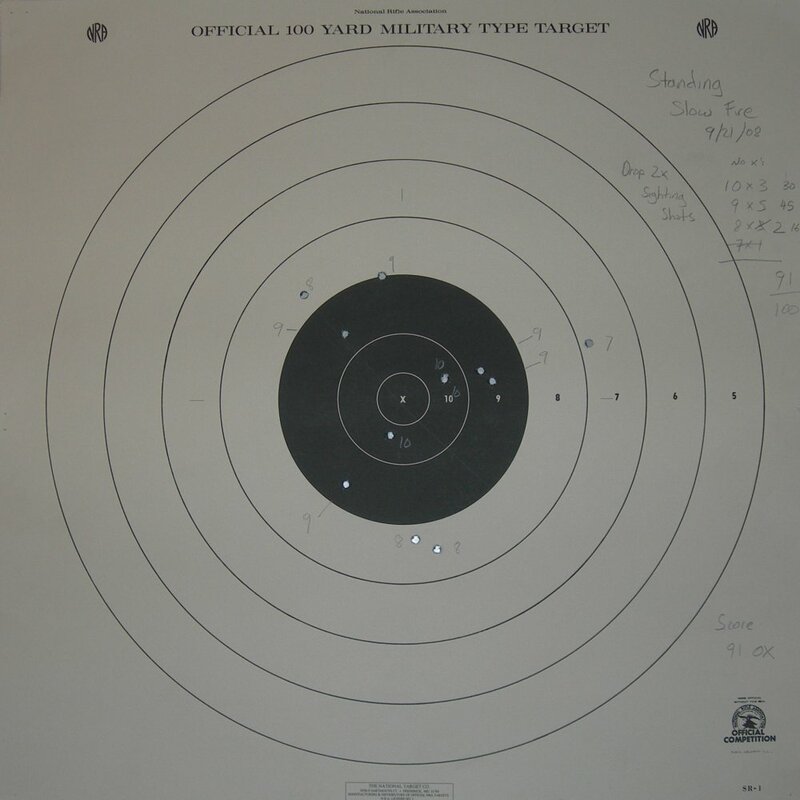 I haven’t had the rifle that long, so I just need to work with it more and find an offhand shooting position that works. Yeesh. I should’ve shot with my buddy’s AR-15. That’s a damned decent offhand. Perhaps I’ll try to beat the score posting and go shoot a string tonight. I’ll have to see if the wife’s game for it.